Europe has the lowest gender parity for entrepreneurs across all regions. Today, examples abound that demonstrate the need for diversity in the training of AI. For example, 45% of ImageNet data, which is commonly used to train computer vision algorithms, comes from the US and only 3% comes from China and India together. This is a problem when you consider that China and India together represent 36% of the global population and the US only represents 4%. But diversity doesn’t just lead to better technology, it leads to better business and financial results. On average, companies with more diverse leadership teams report almost 20% higher revenues from innovation. More specifically, within the startup ecosystem, numerous studies have found that diversity in the leadership ranks yields a better return on investment for investors and better exits for entrepreneurs. One such study showed that, over a five year period, for every dollar of venture capital invested, female-led or female-cofounded startups generated 78 cents of revenue, while male-led startups only generated 31 cents. ⦁ Only 13% of US venture capital (VC) funding went to founding teams that have at least one woman. ⦁ 7% of all funds raised by European VC-backed companies went to founding teams with at least one female founder. 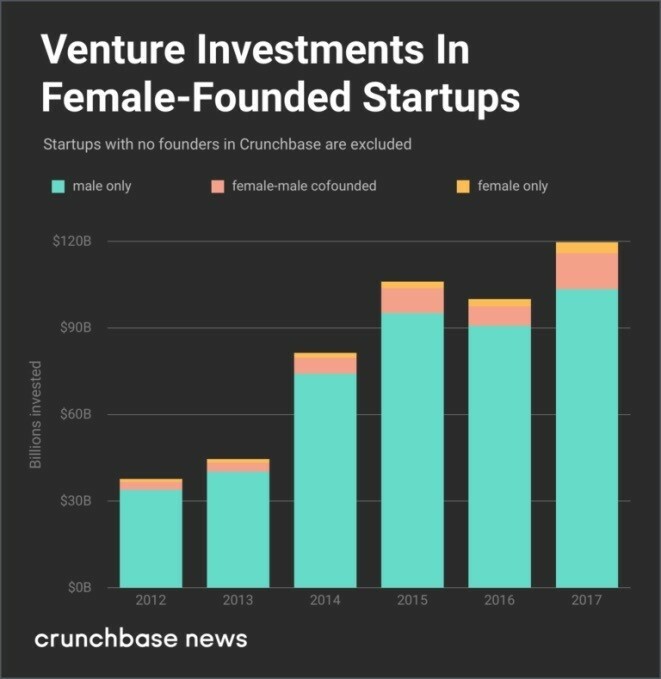 ⦁ Across both the US and Europe, approximately 2% of VC funding went to all-female founding teams. ⦁ Black women have raised just .0006% of all tech venture funding since 2006. Many of these issues arise from the fact that fewer than 20% of software developers are female. There needs to be a structural change in the STEM education model to attract more female developers, which would result in more aspiring female entrepreneurs. In the near term, there is an opportunity to improve the state of women and minority entrepreneurs. Although there has been increased focus on VC investments to women and minority-led startups with the advent of dedicated funds for these under-represented entrepreneurs, inclusive investment is still not standard practice for the industry. Across the board, VCs should proactively increase funding to diverse founders as there is clear evidence that diverse teams outperform non-diverse teams. More than anything, investing in women and minorities is a better business bet. Mentors provide entrepreneurs with role models and resources for addressing their most critical strategic and operational challenges. Mentors also provide valuable advice to founders on how to articulate the value of their ideas for the VC audience and how to raise money effectively. However today, nearly 50% of female founders cite a lack of available mentors or advisors as holding them back. Startup accelerators are a proven way to mentor and help startups scale, especially at an early stage. By having dedicated cohorts focused on women and minority entrepreneurs, we can dramatically increase the mentor network for these entrepreneurs. For VCs, having a diverse leadership team that’s managing both investment and growth enables a culture of diversity and inclusion that permeates everything they do. With a more balanced VC management team, much of the unconscious bias that has impacted the industry will disappear on its own. In the US, only 8% of VC investors are women, and racial minorities are also underrepresented in the funder community: only about 2% of VC investors are Hispanic, and fewer than 1% are black. VC firms need to be proactive in embedding a culture of diversity and inclusion in their management teams. By addressing these three areas, governments, businesses, and societies can better connect under-represented entrepreneurs to the resources they need to be successful in starting and growing business ventures. SAP.iO Fund has committed to invest up to 40% of its investible capital in women and minority entrepreneurs. This ensures that there is a consistent focus on identifying and investing in these entrepreneurs aligned with the goals of the fund. SAP.iO will scale its focus on inclusive entrepreneurship in the accelerators it operates globally. SAP.iO Foundry NYC was established last year to exclusively focus on women and minority founders and has just kicked off its second cohort. SAP.iO Foundry Berlin will dedicate its spring cohort in 2019 to focus on inclusive entrepreneurship. Diversity has been a core value at SAP.iO from the outset. Three out of four of SAP.iO’s Foundry accelerators are led by a diverse group of women. Over 50% of the broader SAP.iO team are either women or minorities. With this diversity, it is no coincidence that 30% of the startups invested and accelerated by SAP.iO have also been led by women or under-represented minorities. With these initiatives, SAP is creating a one-of-its-kind forum for inclusive innovation in Europe and globally.